My dad used to take me out on his surfboard when I was just a babe. He said my first words were, “Biggie! Hangin’ on,” and “Da Boys,” (referring to the other surfers.) Dad says I used to stand up on his outstretched hand as he surfed. I must have bonded to the ocean because it always feels like coming home when I’m embraced by the waves. 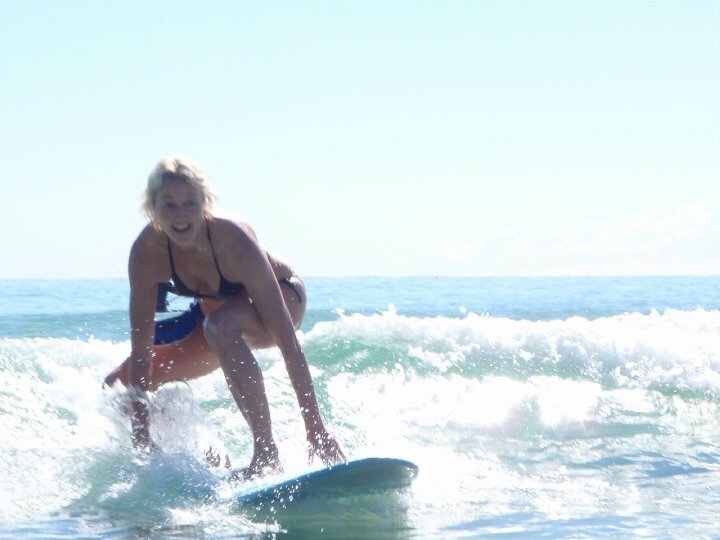 It was only five years ago that I finally bought a board and learned to surf, it’s fantastic fun! To make the most of the way things are. To choose when life rolls toward me and then have fun with it… A healthy balance of freedom and acceptance. To recognise so many elements of the ocean’s personality that exist in the same moment are also in me… rough, gentle, strong, deep, intense, immense, peaceful, dreamy, calm, playful, warm, cool, beautiful, wild and free. What has your favourite pastime revealed to you?